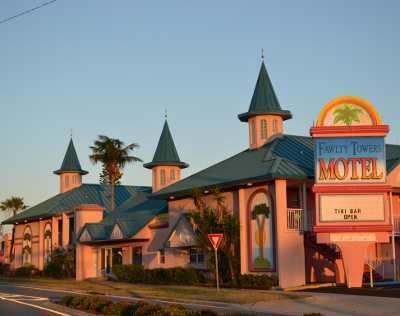 COCOA BEACH, Florida -- The City of Cocoa Beach Commission voted 5-0 at its meeting on May 3, 2012 to have the City Attorney investigate the laws related to the Fawlty Towers Motel operation of a clothing optional resort. The objective of the investigation is for the City Attorney to clarify the laws so that City personnel will know how to enforce the rules and regulations related to that type of business. "This one kinda blind-sided us," said Cocoa Beach City Commissioner Skip Williams during the meeting. Cocoa Beach City Mayor Skip Beeler raised concerns that the $25 day pass to a cover charge at an adult entertainment club. "If a $25 day pass is used like a cover charge for an adult entertainment facility, there's going to be trouble," said Cocoa Beach City Attorney Skip Fowler. Commissioner Ken Griffin railed, "We should not have a nudist colony within the City. I'm opposed to it. This should never have happened." Commissioner Kevin Pruett cited Fawlty Tower's lack of waterfront property compared to other Cocoa Beach hotels. "He doesn't have a river, he doesn't have an ocean. At the end of the day, he lost his ability to compete with price," Pruett said. "I sure wish the guy came up with another idea." Cocoa Beach residents who spoke at the meeting only spoke against the clothing optional motel. "It goes against what Cocoa Beach stands for. This is like a stain, in my opinion, on the name of Cocoa Beach," said Eileen Kalam. The resort, which opened in 1988, is located in the heart of Cocoa Beach's tourist district, just one block away from Ron Jon Surf Shop and on the main road leading to Shepard Park, a popular beach park for visiting tourists. The Fawlty Towers Resort is located at 100 East Cocoa Beach Causeway in Cocoa Beach, Florida. The resort's website says that it will "promote family-orientated nudism, which shall be wholesome and non-sexual." Single males will be required to qualify before being allowed to visit the resort. The layout of the resort has a fully-enclosed community area, with a pool and tiki bar that is not visible from outside the resort property. The motel is the only clothing optional motel on Florida's Space Coast in Brevard County, Florida.